Divertech offers several distinct advantages in monitoring well drilling operations. Hazardous waste such as drill cuttings have always presented problems regarding containment and disposal. 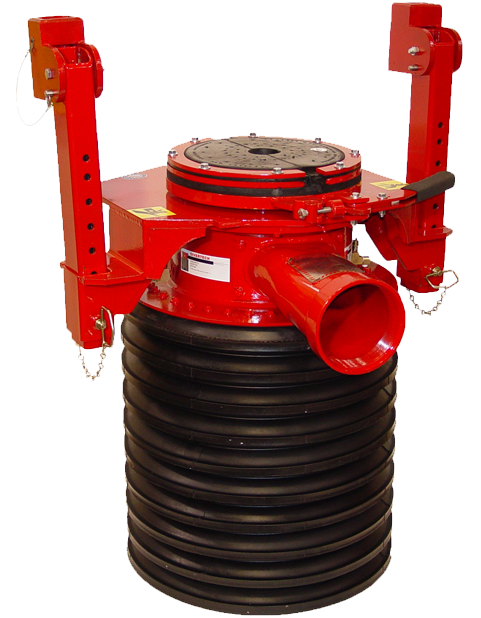 Since the Divertech unit seals around both the drillpipe and the borehole, cuttings are directed away from the rig and personnel, and may be collected, with the use of a small cyclone separator unit, into a truck, trailer, or other receptacle for disposal in a hazardous waste facility. The area around the borehole is free of drill cuttings so the clean-up of the drilling location is quick and easy. Rig, drill pipe, and support equipment clean-up after drilling is kept to a minimum, resulting in significant cost savings. In addition, accurate samples of the rock chips may be collected easily and safely at the separator outlet, providing more accurate sample logging at the laboratory. If multiple sets of samples are needed, a splitter may be installed at the separator outlet for simultaneous collection of several identical samples. Divertech will become an indispensable part of your drilling operations. Your drill will stay cleaner, and require less maintenance, because all drill cuttings, water, and drilling foams are diverted away from the base of the drill. Shoveling is eliminated, which will provide more time for other necessary duties, while the casing hole is being drilled. Where a well is being constructed near a dwelling or in a critical location, cuttings can be diverted to a specific area, selected by the driller or property owner, where they will do the least damage. In mineral mining applications, ore grade control is based on samples obtained from drill holes. Although extensive exploratory drilling is usually done prior to the mining operation, many ores vary in grade to the degree that samples of each hole in the blasting patterns are required for accurate decisions on the part of the mining staff. Obviously, the assayers desire is to obtain the best samples possible. A Divertech unit, mounted in conjunction with a cyclone separator on the blasthole drill can provide accurate representative samples from each borehole. In many cases, this could lead to enhanced mineral recovery and better mill utilization. Many modern oil and gas drilling operations utilize air as a circulating medium. Up to now, there has been no effective means of controlling dust and rock chip disposition until after conductor and/or surface casing is installed and cemented in the borehole. 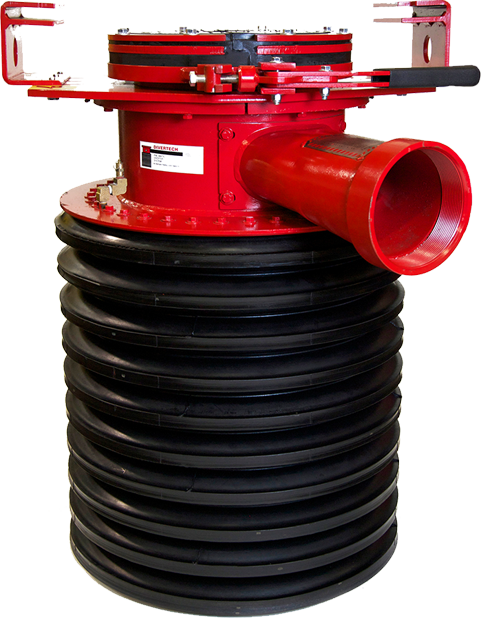 Since Divertech provides a seal against the ground, it is now possible to “spud” a well using a similar flow line to that utilized after casing is installed. This eliminates the mess and shoveling involved in this early stage of oil and gas well drilling. 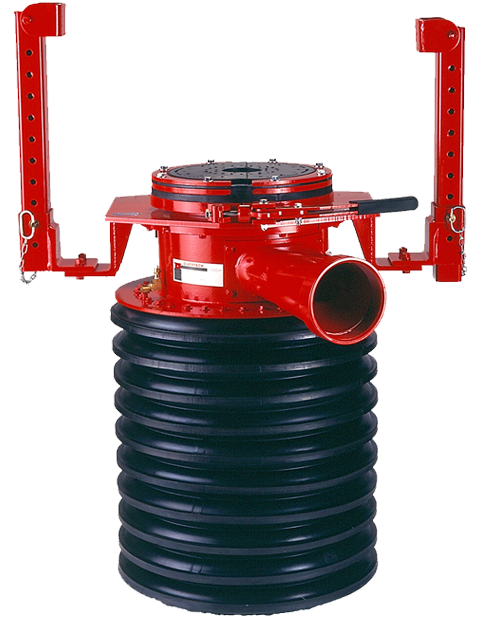 Once the surface hole is drilled, Divertech may be easily removed from the derrick and stored on location until the well is completed. NOTE: The Divertech Pneumatic Diverter is neither represented nor intended as a replacement for blowout preventers, rotating heads, or any other conventional means of well control. Once casing is set and cemented, other well head equipment, intended for this purpose, should be installed. In the underground mining and tunnelling industries, dust and rock chips from blasthole drilling can represent constant safety hazards and disposal problems. A Divertech model specifically designed for this application may be mounted on the base of each drill boom. Dust and cuttings are controlled and removed from the rock face and may be deposited wherever desired, thru a flow line, or collected for grade control purposes, if required. In many drilling applications, water is injected into the air streams for dust control, traveling through the drill pipe and bit or downhole hammer. The injected water forms an abrasive compound which can have a negative effect on bit life, as well as penetration rates. In many construction applications, particularly elevator shaft drilling, the hole must be drilled in a partially completed structure. Divertech allows these holes to be drilled, either with air or other fluids, without creating clean-up problems. The drill cuttings can be piped away from the structure and deposited in an appropriate container or outdoor area.